I have no doubt that behind the scenes, in a delicate Anglican way, feelers are being put out and contacts made both in the UK and Uganda to discern what might be an appropriate reaction to the Bill, and how Church of England leaders might exert and influence. One of the reasons advocated for saying nothing in public is that western outsiders, and ex-colonial rulers to boot, have no right to comment on legislation and morality and church teaching in Uganda. 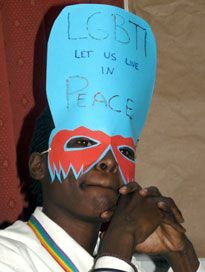 Gug, one of Changing Attitude’s gay Ugandan contacts, begs to differ. “Funny, I am a Ugandan, desperately worried because of this Bill in parliament. If it passes, which most likely it will, I and my partner will face life imprisonment, or death, once caught. “Is it surprising that I don’t mind anyone, even a 'foreigner' speaking out for me? Especially when I cannot speak out myself in my country about this bill? I used to like political correctness until I realised that life does not follow its rules. My country mates plan to kill me, and you fear to say no, because you don’t think you as a foreigner should comment? "It happened in Nazi Germany, for Jews, and homosexuals; it happened in Rwanda as recently as 20 years ago. "When, I pray, do you as a 'foreigner' plan to challenge my murderers that they have gone beyond the pale of humanity? When I am dead? Do you really think that will help?" “I believe it is actually an opportunity for the Archbishop of Canterbury to take back the moral high ground from the Church of Uganda leaders. They have made it abundantly clear that they support the Bill. They support it in its terribleness. And now they have started back peddling. They are in a dilemma. It is almost impossible for them to recant, but the Bill is so terrible that they must recant! These guys have gone too far, and they realise it. They are on the back foot. “Let the Archbishop just be gracious and negotiate with them. I am sure they don’t have a clue on how to retake their international standing. Besides now not having an 'official' stance on the bill, they are stopping the comments. On the day of the debate, the representative of the Church of Uganda who was supposed to support it did not appear. Yes, the pressure is working. Instead, his place was taken by someone else who was sadly funny. Except, the blood they are baying for is mine. They are not in danger! Where is ++Rowan (chatting it up with the anti-LGBT Pope)...where is ++John (ducking comment in York)? Where is Katharine Jefferts Schori, Primate (organizing her calendar when she ought be prioritizing it instead)? Speak out PRIMATES, clergy, cowards (not you Colin) and countrymen/women! Is it possible to be Gay and Christian in Uganda?